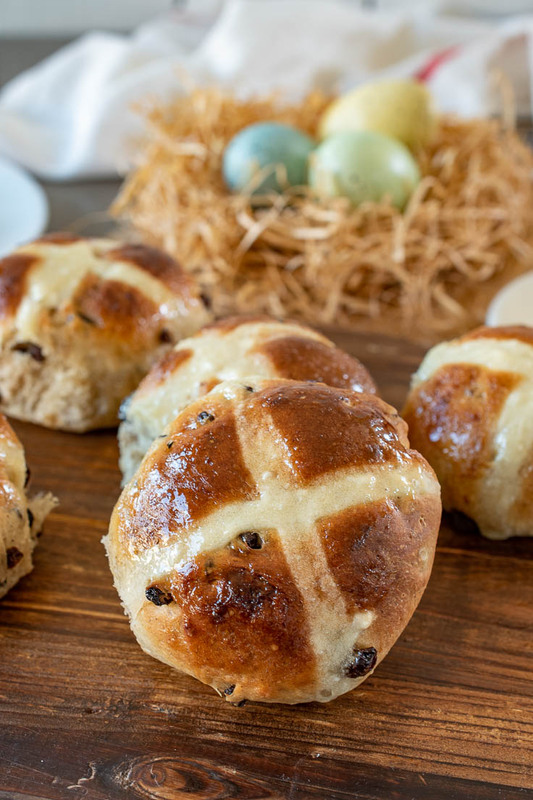 This is an easy recipe for How to Make Traditional Hot Cross Buns. 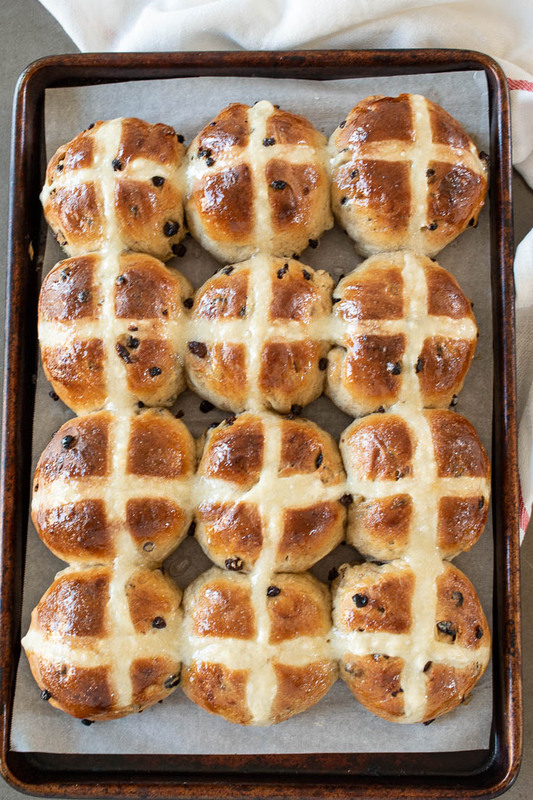 Enjoyed for Easter on Good Friday, these buns will have your mouth watering as you smell them baking in the oven. With spices like cinnamon, all-spice and ginger just the aroma of these buns baking will have you eagerly waiting them. Studded with currants, these buns are best warm out of the oven served simply with butter. This is the same great recipe that I first published in 2014, with updated pictures and a step-by-step video. If there’s a food that reminds me of Easter as a child, it’s the hot cross bun. traditionally eaten in the UK, New Zealand, Australia, South Africa and Canada for breakfast on Good Friday. In fact, all kids growing up in England are made aware of the Easter nursery rhyme about these buns that was published in London in 1798. We all know good food takes time, so there’s a little kneading involved and a little rising, the buns, not you. The dough is kneaded after mixing and then left to rise. The dough is then kneaded again, shaped into buns and then risen for the second time. Before they are baked a cross is made across the top of the buns. This is a paste of flour, sugar and water is piped into the cuts so when the buns are baked the cross is visible. 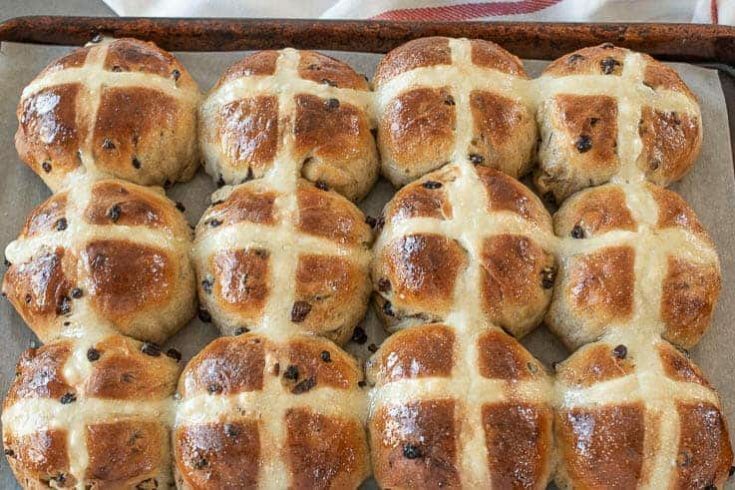 How long do hot cross buns keep? They are best eaten the day they are made. Any that I don’t eat, I keep in an airtight container at room temperature for a couple of days. Beyond that, I freeze them up to 3 months. To reheat, wrap the frozen buns in foil and bake at 350°F/ 177°C for 15-20 minutes. 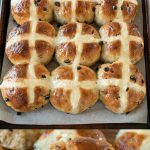 If you’ve tried these Traditional Hot Cross Buns or any other recipe on the blog, then don’t forget to rate the recipe and let me know it turned out in the comments below. I love to hear from my readers! 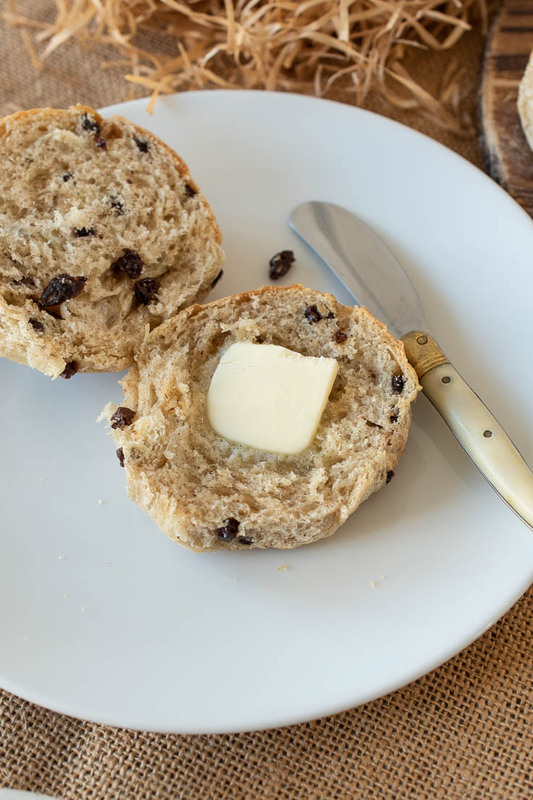 Hot cross buns are a spiced, slightly sweet bun with currants, raisins or sultanas. Stir the yeast and sugar into the milk. To a mixing bowl add the flour, salt and spices and currants, mix well. Make a well in the center, add the milk and yeast, butter, and beaten eggs. Use a spoon to bring the dough together, then use your hands to make the dough to a large ball. It will be sticky. Turn the dough out on to a floured surface and knead for about 5 minutes, until smooth and elastic. Place in an oiled bowl, cover with a towel and leave in a warm place for about 45 mins to rise. The oven turned off is a good place. Turn out dough onto a floured surface and knead lightly for a few minutes. Divide the dough into 12 balls and shape each into a bun. Place close together on baking sheet covered with parchment paper, and cover loosely with a towel. Leave in a warm place for 30 minutes until doubled in size. Preheat oven to 400°F /200°C. Add to a ziptop bag, remove the air and seal. Cut a little off the corner off the ziptop bag and pipe a cross on top of each bun. Bake for 15-20 minutes until golden brown (time my depend on your oven). Add the powdered sugar to a small bowl with 1 tablespoon boiling water and stir until syrupy. Remove the buns from the oven and brush with the glaze while still warm. Cool on a wire rack. To store the buns, keep in an air tight container for up to 4 days. If you find the buns getting too firm, I like to microwave them (one at a time) for about 20 seconds, this will soften them up and also make them nice and warm. If you have no pennies a ha’ penny will do. If you haven’t got a ha’ penny, God Bless you. Thank you, I hope you enjoy them. I do believe that this verse is from a British Halloween trick or treat song. I made your hot cross bun recipe and it is the best. I did tweak a little . I soaked 1/2 cup candied peel and 1/2 cup currants in. About 2 TBSP grand marnier liqueur. It just adds so much flavor. Thanks for sharing this awesome recipe with everyone. I’m loving this idea. I’ll be trying it for Easter. I’m so glad you liked them. I made these yesterday and they really are delicious. I made 12 but they are twice as large as I would use. So next time I’m making smaller buns. Thank you for this recipe. Yummy. They look absolutely delicious. Good Friday just isn’t Good Friday without a warm hot cross bun. 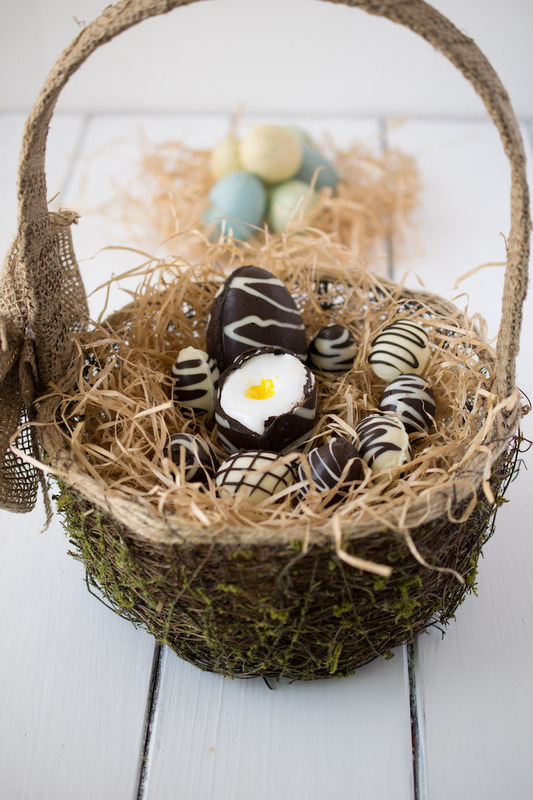 These buns are really beautiful and perfect for Easter brunch! Have a wonderful weekend! I love hot cross buns and like you grew up in England. I find the lurid crosses on the buns for sale in my local (US) stores rather off-putting. Perhaps this is the year when I’ll try making some! 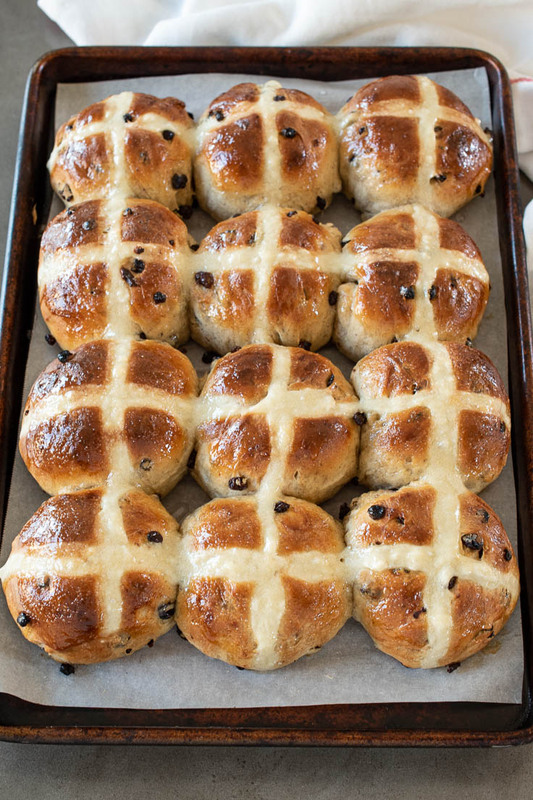 Everytime I am at an Easter Gathering, I am always looking for these Hot Cross Buns. They are my favorite and now I know how fun it is to make them.